Western Digital announced its My Passport portable hard drives are the first portable disks to receive a storage capacity of up to 2TB. Western Digital® (NYSE: WDC) today announced the next generation of its top-selling My Passport® line of portable hard drives, offering consumers a fresh new enclosure design and the first-ever 2 TB capacity in a portable drive. Now available in five popular colors: white, black, silver, blue, and red, with a range of capacities beginning from 500 GB, the new sleeker My Passport portable drives offer digital consumers an appealing array of storage options that reflect their personal style. Additionally, the new My Passport drives offer WD SmartWare™ automatic backup software and WD Security™ for password protection and hardware encryption. "More than money, jewelry and other valuables, the item most missed if ever lost or stolen is one's computer – and everything on it – so our goal in launching the next-generation of the popular My Passport drives is to encourage more consumers to protect their data before something happens," said Jim Welsh, executive vice president and general manager of WD's branded products and consumer electronics groups. "The new My Passport makes backing up and preserving one's digital life easier, reliable and more secure than ever – it's the perfect blend of monstrous capacity, reliability and user-friendly technology in a sleek form factor, now in five colors." My Passport drives come with a 2-year limited warranty and are available online at the WD store at www.wdstore.com and at select retailers and distributors. MSRP is $129.99 USD for 500 GB, $149.99 USD for 750 GB, $179.99 USD for 1 TB, $199.99 for 1.5 TB and $249.99 USD for the new 2 TB edition. 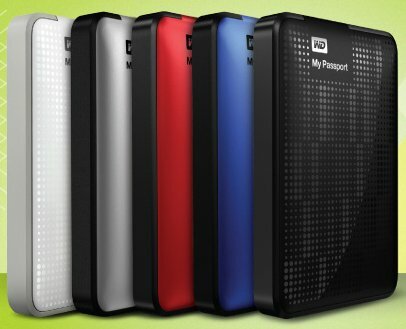 Additional information on the My Passport family of hard drives can be found at http://www.wdc.com/en/products/external/portable/.